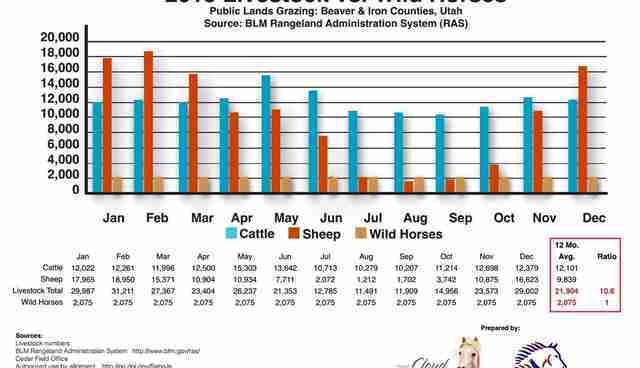 By Nicole Rivard, Friends of Animals Correspondent Recently Equine Welfare Alliance, The Cloud Foundation and Wild Horse Freedom Federation released data from the Bureau of Land Management (BLM) on livestock for Beaver County and Iron County, Utah, showing cows and sheep outnumber wild horses 10.6:1 in these areas, despite a chorus of demands from ranchers for the removal of wild horses from the over-grazed range. 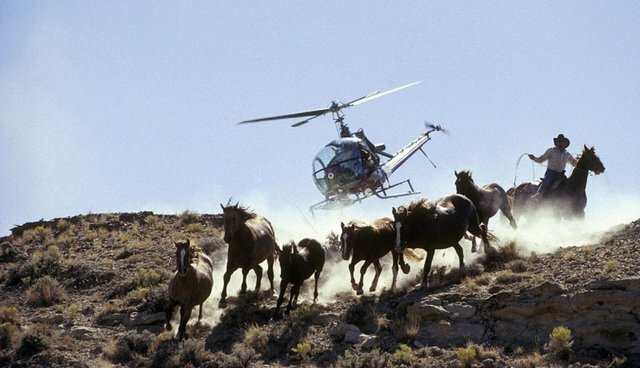 "It is irresponsible and false for Iron County commissioners or anyone to claim that the wild horses in that area are having a significant negative impact on livestock and wildlife as some local news releases have indicated," said Bob Edwards, range scientist and 30-year veteran of the BLM. "Having been well acquainted with these areas for over 25 years as a BLM employee, it is obvious that resource degradation has been and presently is mostly caused by livestock, which have been historically allowed on these areas in excess numbers and duration." The release of this data comes on the heels of Friends of Animals and The Cloud Foundation filing a petition with the U.S. Fish and Wildlife Service to list North American wild horses on public lands as threatened or endangered under the Endangered Species Act (ESA) since the Wild Free-Roaming Horse and Burro Act (WHBA), which was passed in 1971, has failed to protect our wild horses. Six states have already lost their wild horse populations-Missouri, Iowa, Arkansas, Texas, Oklahoma and Kansas. Angry ranchers began demanding the removal of the wild horses shortly after the BLM requested them to reduce their own cow and sheep grazing. The ongoing drought has forced the move. "Faced with the loss of cheap forage for their cattle and sheep, the ranchers found a way to deflect the blame and economic burden," said Vickery Eckhoff, an AlterNet writer who was fired by Forbes after writing an article critical of welfare ranching. "When the BLM refers to wild horses as 'overpopulated' they must have their tongues firmly in their cheeks," said Ginger Kathrens, director of The Cloud Foundation. "The only reason they characterize wild horses as overpopulated is because they allocate the lions' share of forage to livestock." 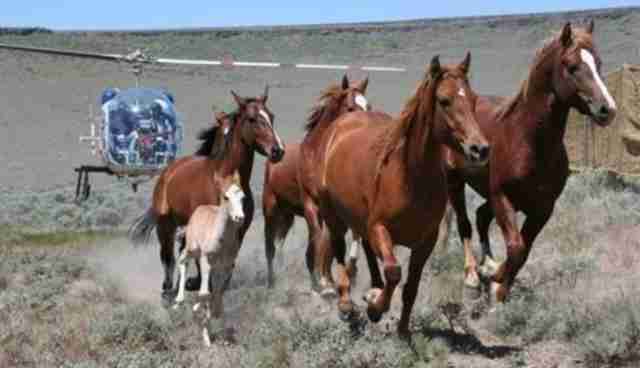 "The BLM is correct on one point," said R.T. Fitch, president of Wild Horse Freedom Federation. "Public lands are overgrazed; but the villains are not wild horses, burros and wildlife. The destruction comes from privately owned, BLM-approved, tax-payer subsidized, welfare cattle and sheep." Despite the BLM's lies, it has permission to remove 200 horses from Beaver and Iron Counties, 140 of which will be removed from the Blawn Wash Herd Area. The BLM's 2014 wild horse and burro removal schedule is going to be particularly devastating to Red Desert wild horses in Wyoming, says equine photographer, and director of field documentation for Wild Horse Freedom Federation, Carol Walker. She points out three specific roundups: Adobe Town 8/20 – 8/24, plan to remove 177 wild horses; Salt Wells Creek 8/24 – 8-28, plan to remove 228 wild horses; and Great Divide Basin 8/28 – 9/10, plan to remove 541 wild horses. These roundups are planned despite having removed 586 wild horses from Salt Wells Creek and Adobe Town in December 2013. "Looking at the numbers provided by the BLM, Great Divide Basin will be virtually zeroed out after this roundup and removal," Walker said on her blog, www.wildhoofbeats.com. "The appropriate management level (AML) for the area is 415-600 wild horses. At their May 2013 count they said there were 439 horses and they estimated that there would be 579 in the summer of 2014. Removing 541 would be almost all, if not all, of them." Walker also did the math for Salt Wells Creek, where the AML is 251-365. "In their projected estimate before the 2013 roundup, the BLM said there were 823 wild horses, they removed 586, and they plan to remove 228. Even estimating a 20 percent population increase this year, this would bring the population below low AML," Walker said. In Adobe Town, the AML is 610-800 wild horses. "The BLM projected the population to be 624 in 2013, they removed 14 in 2013 and they plan to remove 177. Even estimating a 20 percent increase in population this year, this would bring the population below AML," Walker said. Walker said she fell in love with wild horses the first time she photographed the Adobe Town herd back in 2004. To find out more about her journey to becoming a wild horse advocate, check out Friends of Animals' fall edition of Action Line.